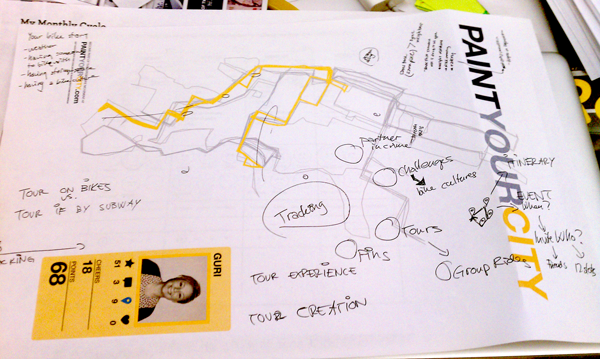 Tracking on the map both inspired people to take new routes and color new parts of the city. We learned that there needs to be different levels and ways of competing—we need to give recognition for different achievements in the game other than distance. Physical installations/Social objects Having physical objects present in the work environment is critical to get people talking - to create water cooler conversations around biking. Time frame needed to be longer than one week. After testing the one-week bike game, King of Two Wheels, we decided to shift our focus from the talking helmet to motivation, focusing on collaborative gaming and tracking. The helmet was still there, but it was becoming less important to us. We decided to shift our focus to motivation. While we want to have live voice directions as a feature, tracking is the key component. Rather than only a device, we are making a movement; A movement toward getting more people to discover their human superpowers through biking. What does this mean? Well, we feel alive and empowered by biking and want to spread the love. 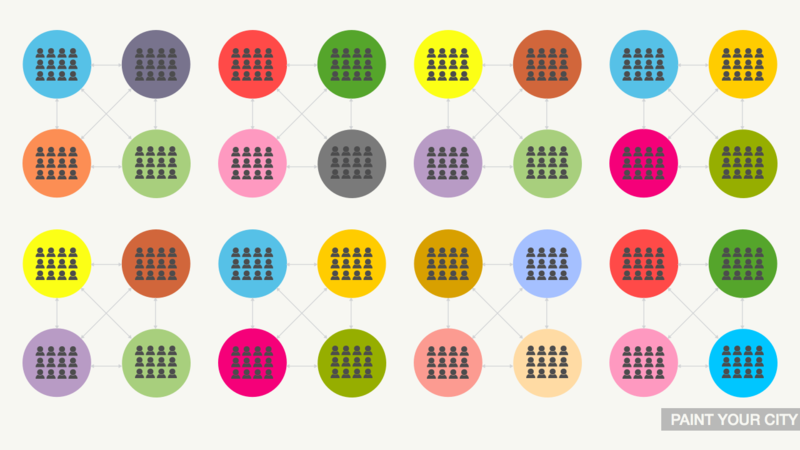 In other words, we want to build a movement to get more people to bike. 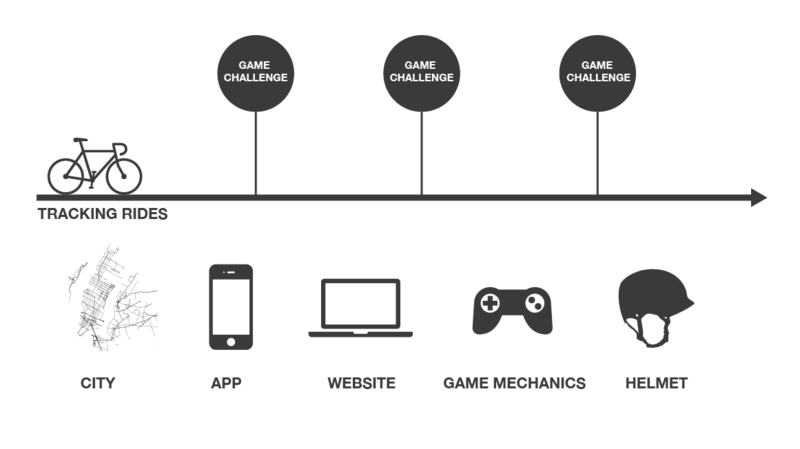 It will be a game-like platform consisting of a website, mobile app, sensing and talking helmet, and game challenges in which the city is the game board. Our audience are those not yet convinced of biking as a primary mode of transportation as well as the casual and committed commuters. Through riding and tracking their rides, they can make a visual mark on the city map. They would simply be painting the city through the trips they take on their bike with their chosen game color. The website will be dominated by visualizations of rides. 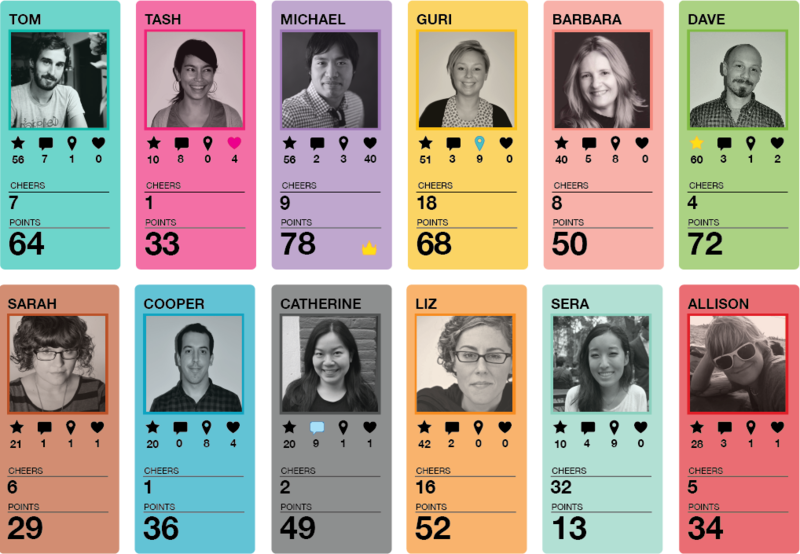 Riders’ tracking activity is displayed, and comparisons can be made between friends, neighbors and strangers. Bikers can simply share their own visual bike story through tracking. However, a biker can also make their everyday rides more interesting and motivating by initiating game challenges between their friends. Games at both small and large scales can be hosted. Games involving a group of people would be more like campaigns challenging individuals to team up, ride more and explore their cities. These campaigns can last for a short or long period of time, and can be hosted within social networks or physical workplaces. Tracking should be a consistent activity where every ride is recorded by the app. To ensure consistency, the start and stop will be triggered automatically by a sensor in the helmet. Along with the tracking sensor, the talking helmet will facilitate digital marking and remembering places or moments on a ride with the ‘pin’ button. This button is also an open framework for other connections to be made between bikers. However, the helmet is not required for riders to participate. We hope to allow for people to use earbuds with a button to provide an experience somewhat similar to that provided by the helmet. We want the barrier to entry to be low, so the only piece required to participate is the app. With this shift, we believe the magic lies in telling your bike story through data-tracking, comparing data, getting to know your neighbors and in building culture through a community of people riding their bikes. This entry was posted in Concept Development by Carrie Stiens. Bookmark the permalink. 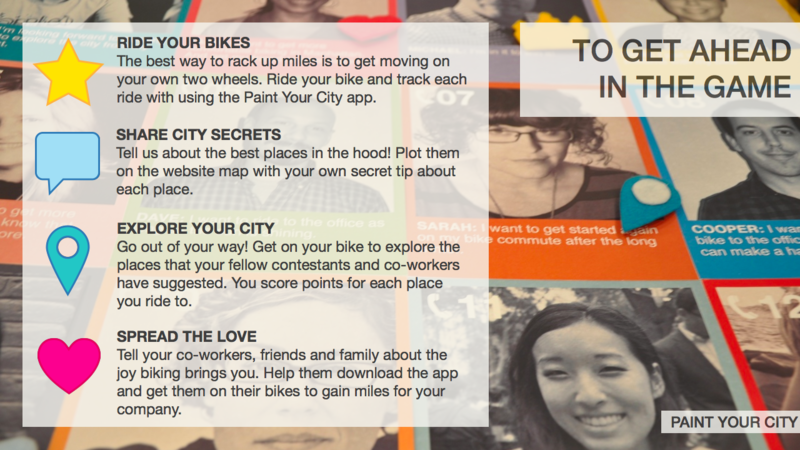 Paint Your City is a social tracking platform, with game challenges, where you use your phone for tracking your bike rides in the city. You can see your beautiful traces visualized on a map on the website, along with rides from friends, co-workers and neighbors. There will be a helmet that compliments the platform, and can enhance the experience of riding. For Kristin and I, biking is not about our calories burned or carbon footprint reduction. It’s simply about the joy it brings to us and that it gives us the ability to explore and know our city better. Not to mention an excuse to be outside, a workout and commute in one, and a flexible schedule. For thesis, we want to spread the joy of biking that we experience to more people. The King of Two Wheels was our first trial run of a bike challenge hosted within a work environment. 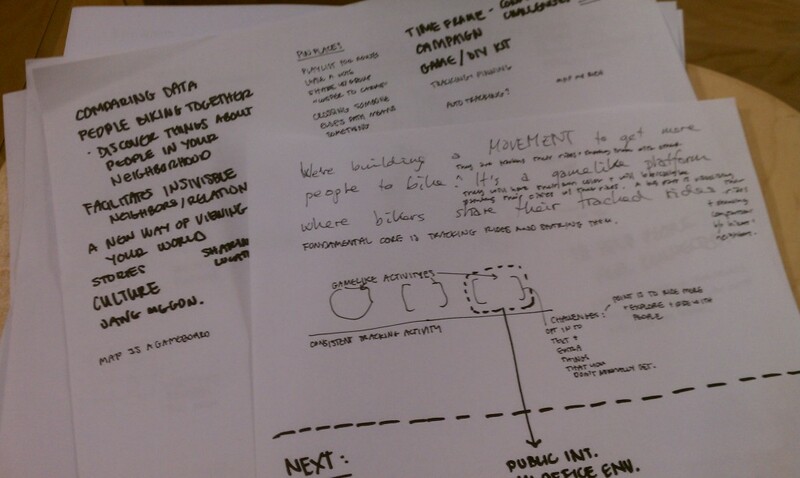 From there, we decided that we want to create a mass movement of people riding bikes. This led us to our thesis concept, Paint Your City (PYC). 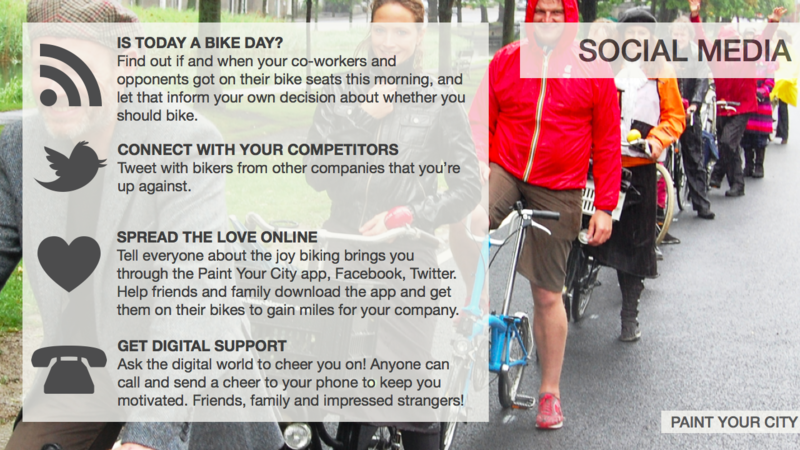 It’s a social tracking platform where riders use their phone for tracking bike rides in the city. One’s beautiful traces can be seen visualized on a map on the website, along with rides from friends, co-workers and neighbors. Many people either fall into biking or start riding because their friends are doing it. The PYC office challenge is a two-week event that embraces social pressure to encourage biking for transportation. 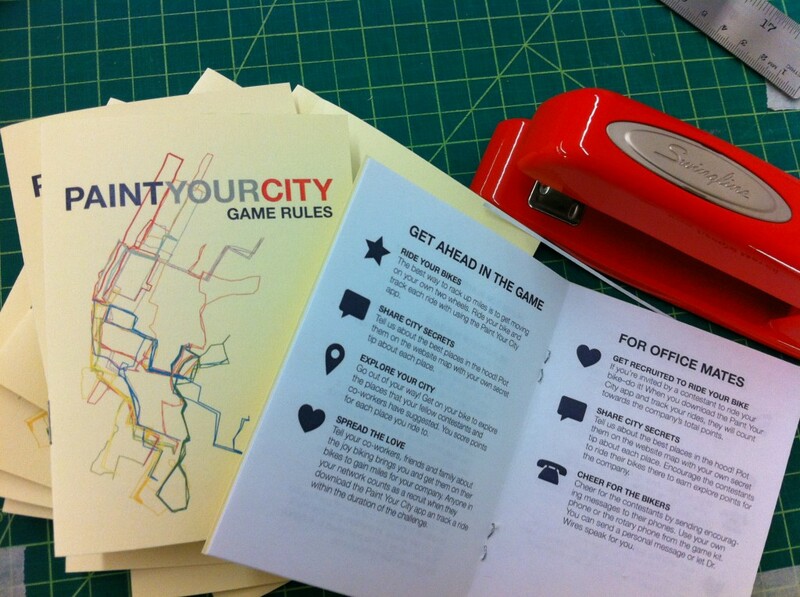 Office workers are invited to join a challenge by Paint Your City or can be challenged by another company. 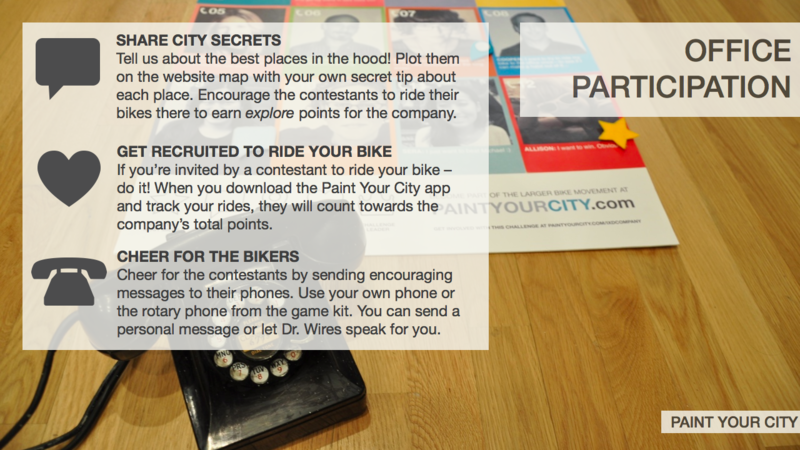 To join, participants upload their photo to paintyourcity.com and choose a color to paint the city with their bike. As an office, they choose their team color to defend their honor as a company. The contestants are competing against each other internally, but are also joining forces to conquer fellow companies. So, they can either challenge other companies or be set up against competitors by Paint Your City. At the large scale, participants can see how their company measures up against all other companies in their city involved in the challenge at that given time. This is no regular competition, though. It is about riding your bike, but also getting to know your city and encouraging other people to start biking. There are four ways to get ahead in the game. (1) Obviously it’s about riding your bike a lot. (2) It’s also about recommending and giving tips about great places in the city—places that you might discover on your bike rides. (3) It’s about exploring the city and trying the places out that are recommended by your colleagues. (4) And, it’s about getting new people to download the app and tracking their rides. Recruiting bikers will also be a way to get ahead for the contestants. These four ways to get ahead in the game are also the four ways that contestants are honored for their achievements—ride, share, explore and recruit. But the rest of the office can also get involved! 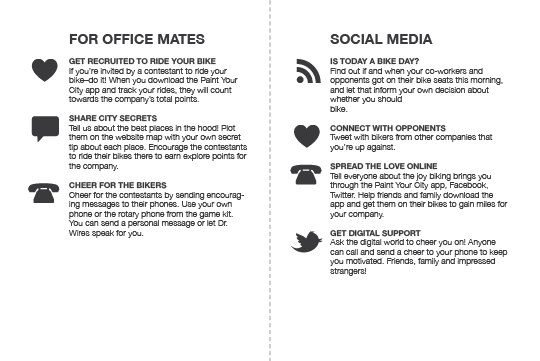 Office mates can get recruited to ride and share city secrets. In addition, they can cheer for the bikers they love. They can do this through their own phone or with a phone provided in a game kit. Twitter and Facebook will help the riders connect and push each other. 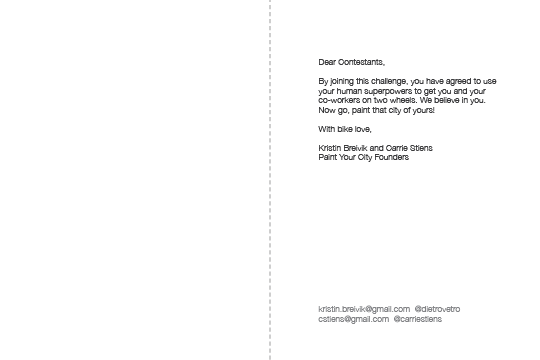 During the exciting and intense challenge weeks, other people’s bike habits will interest contestants more than before. They can easily find out if and when their co-workers and opponents got on their bike seats this morning, and let that inform their own decision about whether to bike or not. Their rides will be broadcasted the moment they get on their bikes! Contestants will be competing against people they don’t know. We want to embrace that and enable them to talk to each other through social media. Of course we will utilize social media both to get more people to bike and to get more support and cheers for the bikers in the competition. Because we want to facilitate water-cooler conversations around biking in the workplace, companies can choose between game kits to heighten the challenge experience. At the very basic level, offices can use the app, website and have access to a visual display of the bike rides that can be projected on the wall. In the premium kit, contestants will get helmet stickers to broadcast to the world that they are painting the city. Companies will also get a contestant poster that honors the bikers and aids cheering. Cheering can be done by through a mobile phone or through the preprogrammed rotary phone provided. At the end of of the challenge, all contestants that are part of the premium kit will be gifted a poster of their achievements. We believe that this artifact will continue to promote the bike culture within the workplace beyond the challenge. A book of game rules will also accompany this kit. This entry was posted in Paint Your City by Carrie Stiens. Bookmark the permalink. Throughout the months, our thesis project has expanded and contracted with ideas; mainly expanded. Though, our challenge all along has been to get more people biking. A break and space away from it has, thankfully, brought us clarity. Our project addresses the needs of urban pedalers. New Yorkers bike in chaotic environments. We want to make riders' trips more seamless while giving them tools to delightfully experience and discover New York from their bike seat and with friends. We're making a digital toolset embodied in a physical bike helmet. It will provide spoken directions, track riding habits and help riders document trips and arrange rides with friends. Unlike a high-tech GPS bike computer, it will have a charming personality and be designed for the casual and committed commuters. 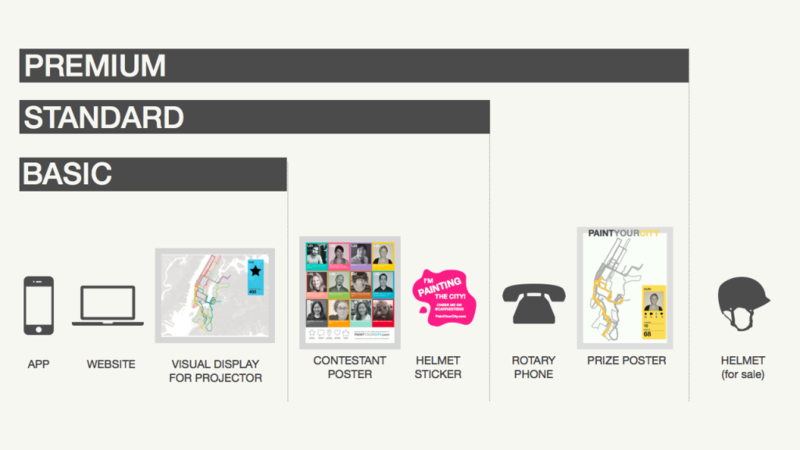 An endeavor that is part of the SVA IxD thesis program, we hope to create your bike's better half. The project continued to involve the helmet throughout the entire semester. 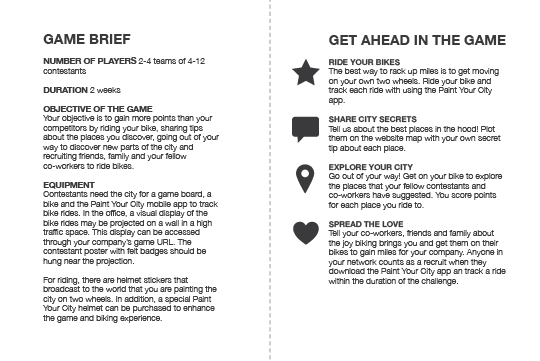 But, in October (2011), we decided to design a game, called King of Two Wheels, to explore our concepts around motivation, wayfinding, tracking, and discovery within a city. Hosting this game throughout a week in our studio got us more interested in the shared work environment as the focus for intervention. We iterated further on this idea through developing office game kits, and digital communal maps to be projected on the office wall. At the end of last semester, the project was filled with opportunities and features' from receiving spoken directions and bookmarking places during a ride to competing for miles and new places with fellow workers. Then, we each took a very deep breath and a three week break to our respective homes, Oslo and Missouri/Texas. We returned to New York and realized that, rather than adding capabilities to the bike ride itself, the project should focus on how to motivate people while they are not on their bike seat. We believe and have seen the power of data tracking on a communal map, and will leverage this idea as the core of the project. It’s called Paint Your City. All of these are fairly fitness focused, and overwhelming in their data capturing: calories, speed, altitude, pace, heart rate, individual achievements. If our target audience is riding to get around, explore, discover, many of the features of these apps are not applicable. 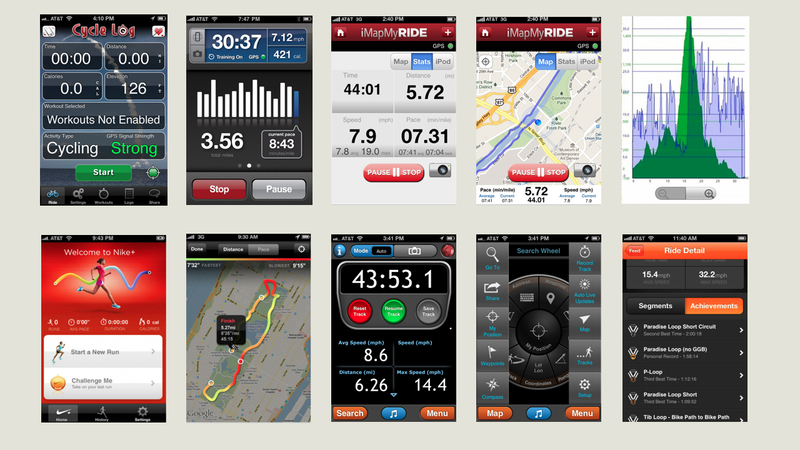 We still ended up using MotionX for iPhone and My Tracks for Android as our third party apps to capture ride data. This is because these provide the easiest way to send your ride data directly from the phone to the SPOKED web site.